I just finished watching this touchy 91 minutes movie . According to Wikipedia, it is based on a true story from the Director’s friend. 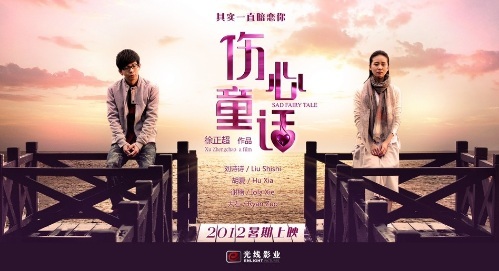 Sad Fairy Tale (Chinese: 傷心童話) is a 2012 Chinese-South Korean romantic comedy film directed by Zhengchao Xu. The story is adapted from true events in the life of Wang Xiao Yi(汪小一）, friend of the director. liu Tong (Hu Xia) is a computer programmer in a film and television studio. He is a worker who is quite, stubborn and solitary. His beautiful colleague Yang XIa (LSS) is adored and pampered by all. She has an innocent aura and could almost pass as a princess in a fairy tale. Many people in the company are attracted to her, including her covetous boss. Nevertheless, Yang remains stubbornly single. Liu plays close attention to Yang, helping her resolving her harassment problem with courage and wisdom. In order to protect herself from the boss, Yang always pretends to faint at the right moment. DUring these times, Liu stays by her side. One day he comes up with the groundbreaking idea of making Yang believes that she can leap through time so that she can be a true fairytale princess. 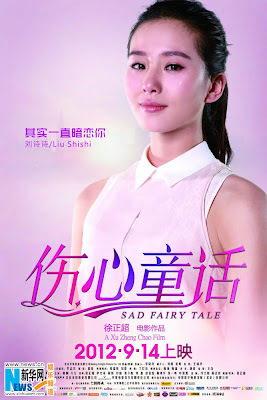 Sad fairy tale is a story about carrying one’s destined love in one’s heart through joy and tears. The story is awesome… It got me to cry at five minutes before the movie ends. However, the one thing which strikes me the most in the movie is the well played character by Liu Shi Shi… She really nailed this movie!! Anyway, I just realize that LSS’s body posture is so amazing when she was standing or sitting or even doing anything. It must be because all of the ballet training… Just look at the picture for example.. Her body posture is just so amazing..